Vanity Fair have exclusively debuted a fantastic new portrait featuring sisters Katniss and Prim in their Mockingjay movie outfits. Appropriately titled 'The Sister Portrait', the new image will premiere this week at the Cannes Film Festival in France in honor of The Hunger Games Franchise. For all the attention given to “Team Peeta” and “Team Gale,” there may be no stronger relationship in the Hunger Games movies than the one between Katniss and Prim. 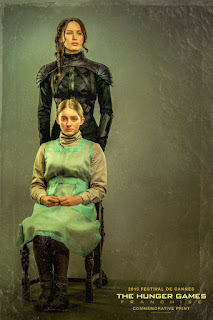 Katniss, the older sister played by Jennifer Lawrence, is fiercely protective of her younger sister (played by Willow Shields), and it’s her volunteering to take her sister’s place in the Hunger Games that kicks off the entire story. But that sisterly bond doesn’t seem to get the same kind of attention as the dueling romances. The image is shot by Tim Palen, and appears similar in style to the first run of character posters released for Catching Fire. It will also be featured in his upcoming book, 'Photographs From The Hunger Games', now releasing exclusively at assouline.com on June 29th, and everywhere else on July 29th.